The study of brain development and degeneration is hindered by a lack of physiologically realistic models. French scientists have now developed a way to reconstruct neuronal networks in a microfluidic system to more closely mimic the directional neuronal pathways found in the brain. Current experimental brain models include neuronal cell cultures and whole animal models; however, the former lack the complex architecture found in vivo, and the latter restrict studies at the cellular level. Aiming to bridge the gap between these models, Jean-Louis Viovy of the Curie Institute, Paris, and coworkers have developed a microfluidic device that allows for the growth of oriented and functional synaptic connections in vitro. The device consists of two cell culture chambers connected by microchannels, through which axons - nerve fibres that conduct impulses away from the body of the nerve cell - can penetrate to form neuronal networks. In previous setups, replication of the unidirectional networks found in vivo could not be achieved since axons were sent from each chamber to the one opposite, travelling in both directions across the microchannel. Inspired by the observation that axons can be mechanically constrained, the team modified the device to include asymmetric, funnel-shaped microchannels, termed ’axon diodes’, to allow axons to grow from only one chamber to the other and not the opposite way. The concept was verified by experiments with mouse cortical neurons, in which the axon projection was 97 per cent selective for the ’correct’ direction. Next, by seeding cortical neurons (from the outer part of the brain) on the emitting side of the device and striatal neurons (from the inner part of the brain) on the receiving side, the team demonstrated the reconstruction of an active neuronal pathway involving two different neuronal subtypes. Furthermore, these networks were routinely maintained for three weeks in vitro, which would allow for both short and long-term experimentation. 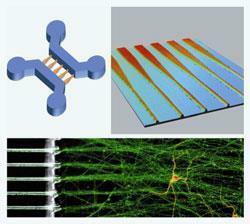 Such a device has many potential applications in neurobiological research. An initial motivation for this work was the requirement of a model to study the progression of neuronal damage in degenerative diseases such as Alzheimer’s. Additionally, Viovy believes the system is also an important platform for research into brain development and cognitive science. ’How neurons communicate regarding information transmission is also an area in which we currently lack a model of the kind we have proposed here,’ he says. The team are currently working on further increasing the complexity of the networks, to more accurately model the neuronal organisation of the brain.